There are so many fun things to do with the kids this Summer. We’re sharing some of our favorite Summer activities with you today!!! To get started, grab a few inexpensive ice trays. In each open space, place a small plastic bug, amphibian, or reptile. Add water and freeze them overnight. You can involve your kids in this part of the process, putting the bugs and critters in place, or even pouring water! If you want to really want to think big, you can get a shoebox size plastic container and fill it full of animals. The biggest hit is always the dinosaurs! There’s always something fun about digging the dinos out of ice…but we’ll get to that in a minute! After freezing all of these goodies, the next day will be filled with lots of fun! You can have the kids drop the “ice cubes” in glasses of water…melt them on hot pavement or even melt them in their hands! However, the large block of ice will call for a hammer and a screwdriver. Let the kids dig for the dinos and get them out however they can. Looking for a few more tips? Check out these fun Summer activities we’ve been doing lately. Grab some lumber crayons and let the kids draw on a piece of wood. You can find leftover pieces from an old project or get some from a local hardware store. 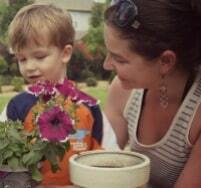 Let the kids choose and name a flower from the hardware store while you’re there. It will be fun to watch it grow together through the Summer. You can even decorate the flower pot together! Author bio: Elizabeth from This Little Home of Mine is an elementary teacher turned mommy of two. She loves finding creative ways to keep her little guys busy. For more fun Summer activities click below! I’m going to have to try this for my 6 year old. He gets bored so easily but I think rescuing toys with a hammer would be right up his alley! I use a big tub, and freeze different​ layers using water coloured with food dye. It takes a couple of days but keeps my son entertained for hours. I love this idea so much. I’ve never seen it before and it looks like so much fun. I know my boys will love it. 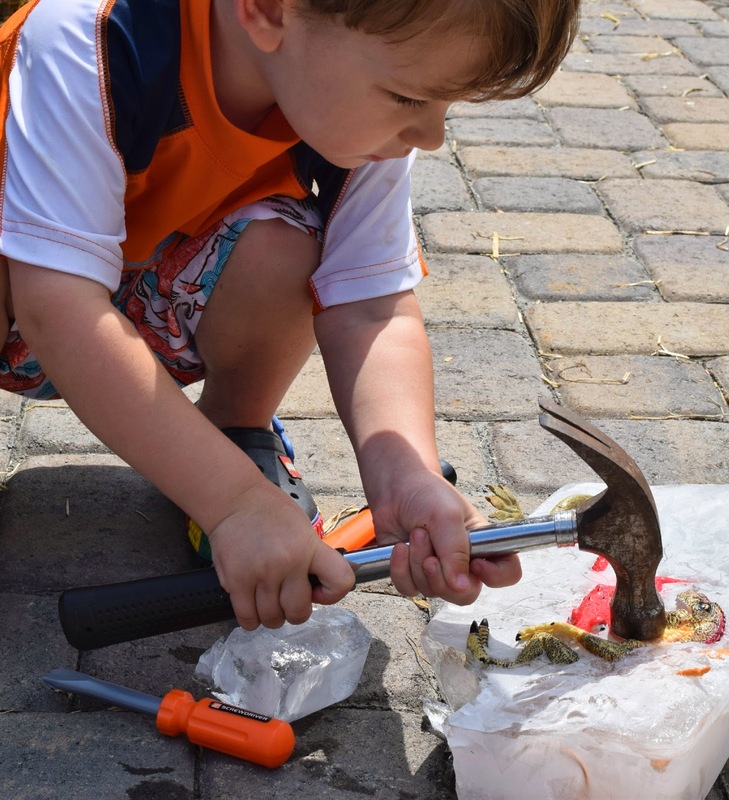 Hey Buddy!, I found this information for you: "Hammers and ice blocks – summer activity for kids". Here is the website link: https://www.beautythroughimperfection.com/hammers-ice-dinosaurs/. Thank you.